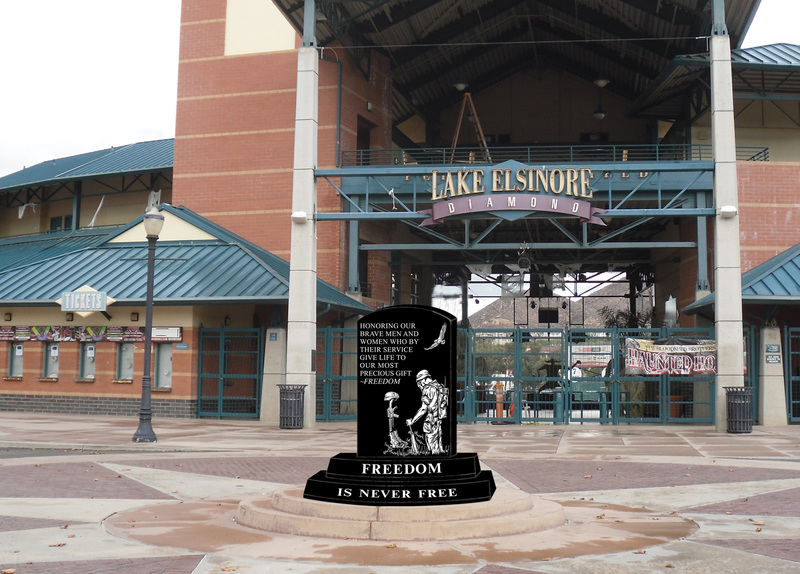 Let Us Help You In "Telling the Story Between the Dates"
BY MICHAEL J. WIILIAMS / STAFF WRITERPublished: Nov. 4, 2014 Updated: Nov. 5, 2014 1:48 p.m.
More than two years after its conception – and after much controversy and legal troubles – Lake Elsinore’s veterans memorial monument stands ready to serve. 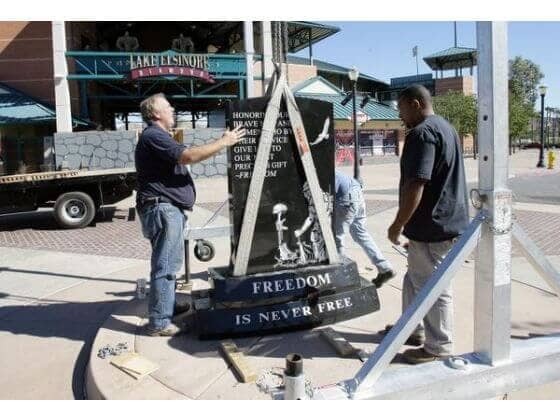 Installation of the monument at The Diamond stadium concluded Tuesday. It will be unveiled Sunday. Also etched in the stone are images of a soaring eagle and a soldier facing empty combat boots propping up a rifle, on which rests a helmet. Sun City Granite Inc. owner Joe Mehochko said the combined weight of the granite slabs is more than 3,600 pounds. City officials selected the company to construct the monument in 2012. 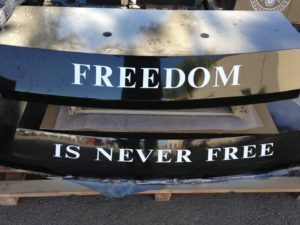 But the project was delayed over what would be etched on the stone. After forming a committee to come up with a design, the City Council approved a design that included Christian crosses and Stars of David, despite opposition. Two residents successfully sued the city to block the design as a violation of the principle of separation of church and state. Though a nonprofit legal group defended the city at no cost, the city wound up having to pay plaintiffs’ attorneys fees of $200,000, dwarfing the $60,000 budgeted for the project. While the court case played out, the blank slabs shipped from India sat at Sun City Granite’s headquarters in Perris. “(Veterans memorials) can take years by the time you get through all the committees, and a lot of times it takes years to get the funding together,” Mehochko said. Mehochko, accompanied by installers Larry Young and Vincent Martinez, managed to slide the central slab into place after about three hours of maneuvers Tuesday morning. On the previous day, his crew built the other section of the monument that greets visitors as they arrive at the stadium. That part consists of five black granite pedestals engraved with the emblems of each of the five U.S. military branches. 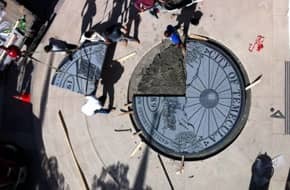 The circle of pedestals is surrounded by more than 150 engraved pavers purchased by local residents to honor service members or their own service contributions. More will be placed there in the future. The city contracted Avila Landscaping to put up a flagpole in the center of the pedestal display and install lights for both sections. 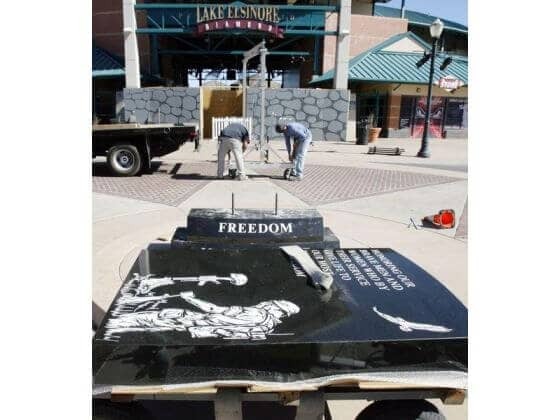 The City of Lake Elsinore is set to install its Veterans Memorial designed by Sun City Granite Headstones and Monuments, and will officially unveil the memorial to the community during the Lake Elsinore Grand Prix on November 8th or 9th. Preparations for the installation of the City’s Veterans Memorial at the Diamond Stadium are expected to begin the week of October 13th. The date and time of the unveiling are not yet confirmed. 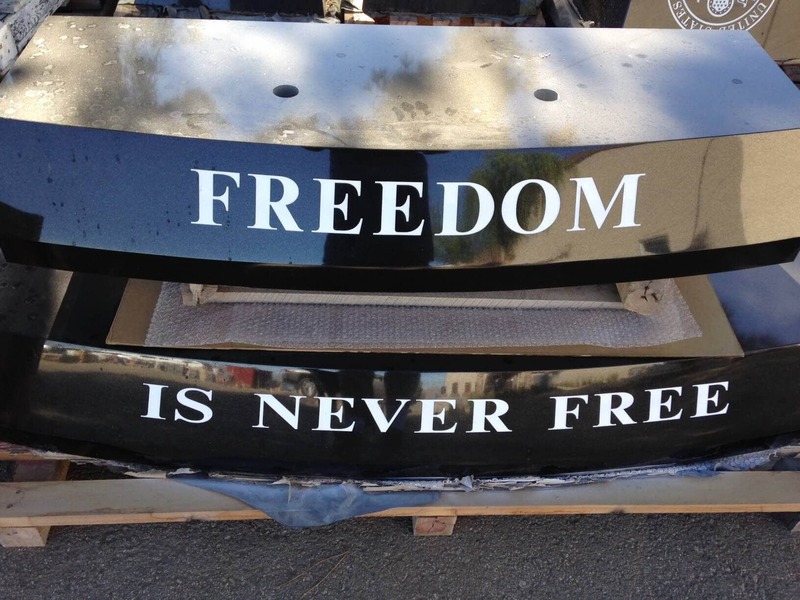 The custom memorial is made from premium black granite Sun City Granite will provide the monument, and will include two monument areas in the main entrance area of the Diamond Stadium. The City’s new Veterans Memorial includes two monument areas in front of the entrance of the Diamond Stadium. The upper memorial area is a large, custom premium black granite monument etched with the depiction of a solider in front of a fallen soldier’s battlefield grave. The grave is marked by the rifle, helmet, dog tags and the boots of a fallen soldier. This has become a well-known symbol to respect and honor those lost in battle and is a practice that dates back to the American Civil War. 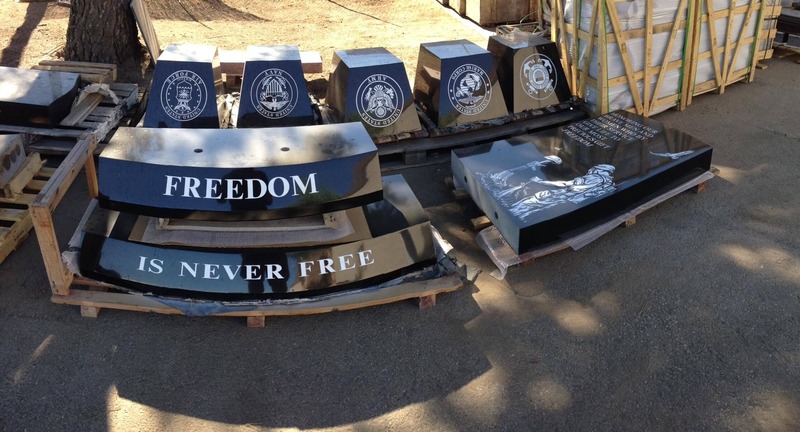 The lower monument area will include five premium granite pedestals with the insignia for each of the branches surrounding a twenty-five foot flag pole with lighting. Finally, the memorial includes the engraving of surrounding bricks that Veterans and/or their families can purchase to honor their service. The local American Legion Post 200 and the VFW are assisting the City with administering its new Memorial Brick Program. Forms for the program are available on the City’s website, www.Lake-Elsinore.org, or they can be picked up and submitted to the local American Legion or VFW. The cost of each brick is $30 and includes three lines of information with room for 20 letters, spaces, and punctuation on each line. Residents of the City or surrounding county areas are encouraged to purchase these bricks to honor their family and friends. Bricks will only be engraved once per year. 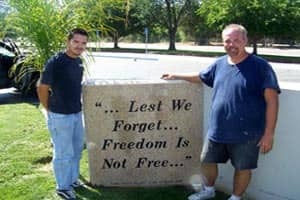 Every year, the City will unveil the latest memorial brick requests at an annual Veteran’s Day Observance during the Lake Elsinore Grand Prix to honor these veterans. To ensure a brick is included in the upcoming unveiling this year, forms and payments for bricks must be received by Friday, October 17th. The Veterans Memorial design and location were determined by an Ad-hoc Veteran’s Memorial Committee that included representatives from the City, Lake Elsinore Historical Society, Storm Baseball, Elsinore Valley Cemetery, and various veteran affiliated groups in the community including the VFW and the American Legion. If there are any questions regarding the Memorial Brick Program, please contact Nicole Dailey at (951) 674-3124 or by email ndailey@lake-elsinore.org.